IEEE 1599 is a language for a comprehensive description of music standardized by IEEE Standards Association in 2008. 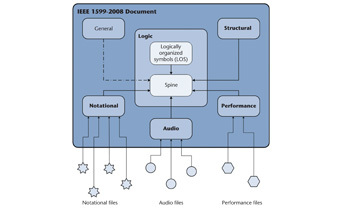 IEEE 1599 provides a meta-representation of music information within a multilayered environment, which achieves integration among general (metadata), structural, notational, computer-driven performance, and audio layers. IEEE 1599 integrates music representation with already defined and commonly accepted standards and formats. IEEE 1599 strives to be both an interchange format among different applications and an aggregator for heterogeneous music-related contents. Concerning applications, the standard addresses any kind of software dealing with music information, e.g. 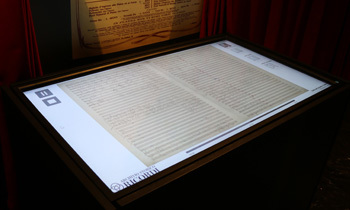 digital score editors, OMR systems, web and mobile apps, musical databases and archives, and performance, composition and musicology-oriented applications. Music information encoding often adopts several distinct reference formats for audio (e.g., CD-DA, DVD-A, FLAC, MP3, AAC), for computer-driven performance (e.g., MIDI, MPEG, SASL/SAOL), for music scores (score editors’ proprietary formats, MEI, MusicXML). Some of these are formal standards, others represent de-facto practices. Each of these deals with musical information only in a restricted sector, and not addressing all its aspects simultaneously. Nowadays there is a strong need for the integration of the various layers musical information is made of (audio, performance, music notation, musical forms, metadata), in order to provide access to all these layers interactively and as an integrated whole. This makes it possible, for instance, to navigate score notation while listening to the corresponding audio (score following), to compare in real time different graphical representation as well as audio performances, and to interact in a multi-model environment with musical contents. IEEE 1599 encodes all music-related information in XML, which is a hierarchical, extensible, portable, and machine and human-readable language. IEEE 1599 paves the way for novel applications for music enjoyment, publishing and research, such as innovative multimedia products, music-oriented educational platforms, and software tools for the maintenance and exploitation of cultural heritage. What can you do with IEEE 1599? See the ▸music collection available online, the page of IEEE 1599-based ▸applications and the list of ▸exhibitions where the standard was used. 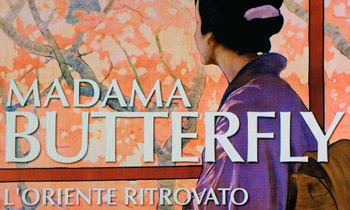 The exhibition Madama Butterfly. 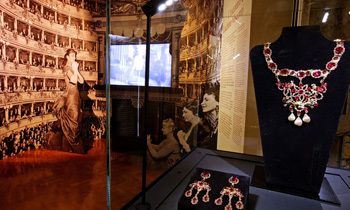 L'oriente ritrovato held at LaScala Theatre (November 2016 - February 2017) contained a multimedia installation powered by IEEE 1599 for the advanced score following of the aria "Un bel di vedremo".